Wherever there is someone who needs something for their pet, then I send it! Palmar Logística keeps growing and we have a new addition to the team. He recently joined the company and he plays the official welcome. 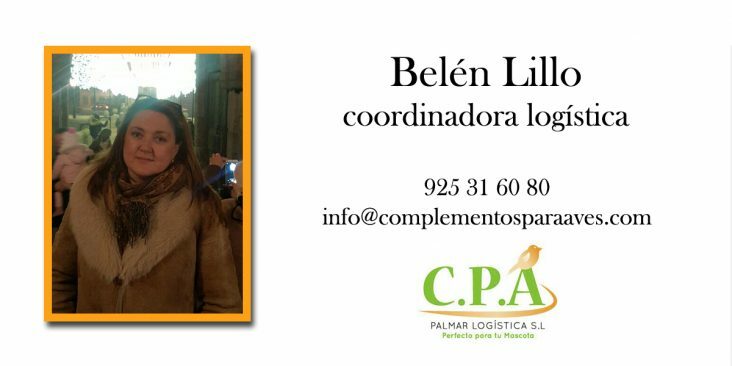 I present it to you; She is Belén Lillo, the new one in charge of sending all the orders that you make to us daily to Palmar Logística. In Palmar Logística Belén plays a key role. His day to day is to revise and prepare all the packages that leave our warehouse, to attend to the transport agencies, to control the stock of the warehouse and to make that everything arrives to the perfection. Your mission: Let Palmar products reach any part of the world! For her to work for and by animals has become a great satisfaction. Now he's discovering the world of birds, which he totally didn't know, and he seems fascinating. "I talk to customers, they tell me how they raise and pamper their birds, and I love it." For her the world of pets is not at all unknown. "In my house there are fish, turtles and a dog called Suri, which we want with locura…es a mestizo a little" surly ", but with me is all love!" In addition, his family takes care of 4 Labradors, 2 donkeys, ducks, geese, hens and other farm animals that they have in the field. Bethlehem loves to pamper them, the care of their husband and brother-in-law are in charge. The whole family is involved. And at work he has Bosco, the German Shepherd of Palmar Logística… A keeper who keeps him company in the warehouse and follows him everywhere. If you need to contact her, you can do it in 925 31 60 80, info@complementosparaaves.com, leaving a message on our Facebook page or leaving a message for her in this post.